Jones, who faces eight lawsuits over his comments on the Newtown shooting, made the psychosis claim in a deposition. InfoWars host and conspiracy theorist Alex Jones said his false statements after tragic mass shootings were caused by a "psychosis." Jones made the claim during a sworn deposition in the defamation case brought against him by family members of Sandy Hook Elementary School shooting victims. The three-hour deposition was posted online Friday by the Texas law firm representing some of the Sandy Hook families, Kaster Lynch Farrar & Ball, LLP. Jones, who is facing eight lawsuits regarding his comments on the Newtown, Connecticut shooting, is accused of perpetuating conspiracy theories that the tragedy was a staged event and that parents lied about their children's deaths. The lawsuits "seek to hold Mr. Jones accountable for his vile assertions that the Sandy Hook parents were lying about what happened to their children," according to the firm's website. In the three-hour disposition, Jones said that "the public doesn’t believe what they’re told anymore" because of corruption in the government and the "mainstream media." "And I, myself, have almost had like a form of psychosis back in the past where I basically thought everything was staged, even though I’m now learning a lot of times things aren’t staged," Jones said. He did not follow up his assertion with information on where he may have been evaluated or diagnosed with a psychosis. Jones also said that the "trauma" of the media "lying so much" caused him to distrust everything. 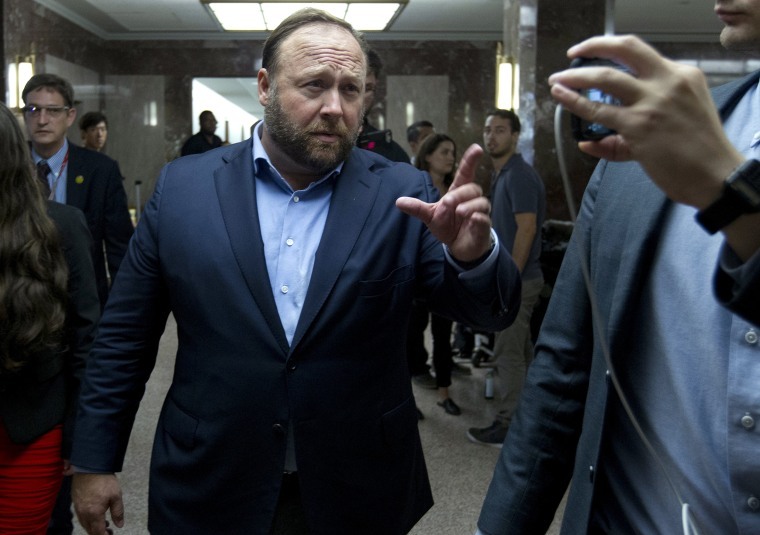 "So long before these lawsuits I said that in the past I thought everything was a conspiracy and I would kind of get into that mass group-think of the communities that were out there saying that," Jones continued. "And so now I see that it’s more in the middle. All right? So that’s where I stand." A full transcript of the deposition was posted online by HuffPost, which first reported on the deposition. Jones is the personality behind InfoWars, a radio, website and internet empire that has been widely criticized for pushing conspiracy theories alongside medically dubious dietary supplements and supplies for people preparing for doomsday. In recent years, Jones has suggested the attacks on Sept. 11 were an “inside job” and that bombings in Oklahoma City and at the Boston Marathon were staged by actors. He has also claimed that vaccines and “chemtrails” are part of a government plot to injure Americans, and that the government puts fluoride in water to turn the population gay and kill them. Jones faced a number of legal challenges last year. In April 2018, a Massachusetts man sued Jones for $1 million, alleging that Jones had falsely identified him as the gunman who killed 17 people in a school shooting in February in Parkland, Florida. In March 2018, a Virginia man who filmed a deadly car attack last summer at a far-right rally in Charlottesville, Virginia, sued Jones. The suit alleges that Jones had falsely labeled the man, Brennan Gilmore, a CIA operative and publicly accused him of staging the attack. A judge ruled Friday that the defamation portion of Gilmore's lawsuit can move forward, but approved a motion to dismiss claims for the intentional infliction of emotional distress, according to court documents.